A small black pouch that Toluca gave him, holding some sparse medical supplies. He hides it underneath his scales. 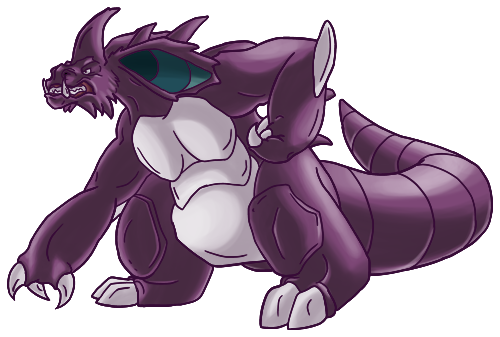 Pokédex Entry Nidoking's thick tail packs enormously destructive power. With one swing, it can topple a metal transmission tower. Once this Pokémon goes on a rampage, there is no stopping it. 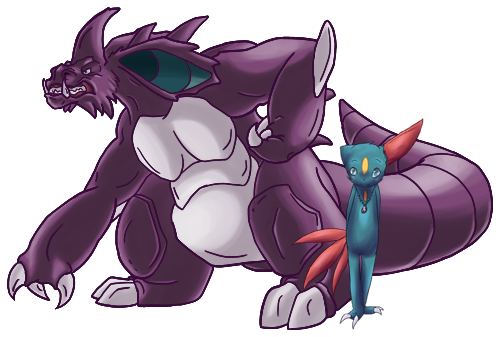 History Strix was a young Nidoran when he first came in contact with humans. He was one of the few pokemon on route 35 that didn’t get caught or captured by newbie trainers. Though he was small and young, he was always vicious and untrusting. He would often get into battles with young trainers, just to poison their pokemon, then attack the trainer once their pokemon was down. His family was large, but the young Nidoran quickly made a name for himself as being the most vicious. His family disowned him, his mother running him away in rage. She was a single mother, his father disappearing before they were born. He had no family, and no friends, but he liked it that way. His home was in an obscure patch of forest, where he thought that nobody would ever bother him; but a young trainer by the name of Toluca had stumbled into his territory, looking for the poison pokemon who kept sending young kids to the hospital. They fought, her pokemon defeated quickly. But instead of trying to flee, she threw herself onto him, not letting him run or fight more. 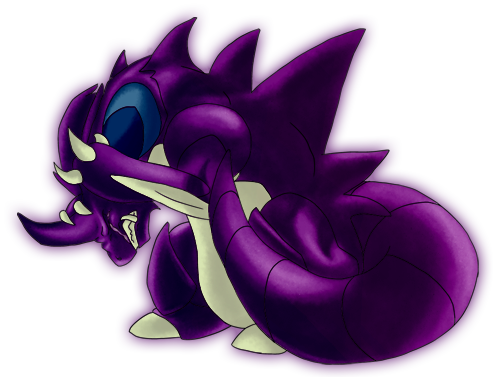 The Nidoran tossed and bit in confusion, his venomous spines digging into the girl, but still she held him. Very quickly, the girl fell into a poison swoon. Instead of finishing her and fleeing, he stared at her in bewilderment, before running to the main road. Without any hesitation, he attacked a police officer, luring him to the felled trainer and disappearing into the brush to watch from hiding. The human brought the human to the local hospital, where she was treated. The Nidoran followed and watched from afar, waiting until she left the building on her own. When she was discharged, he was waiting for her, wanting to make his attack up to her. Toluca and her pokemon fought and trained hard, Nidoran evolving quickly into a Nidorino, and again into Nidoking when Tullie gave him a moon stone. Once evolved, he was named Strix, to match the ferocity and strength that he possessed. Strix would often travel out of the pokeball, and jump at other pokemon that he happened across, either making them angry or scaring them half to death. He enjoyed scaring others, just for fun. He could never scare Toluca though, try as he may. She never saw him as a monster, and that was the main reason he stayed loyal to her. Once the epidemic hit, they all started to travel to more obscure locations, trying to avoid cities. They were making their way around Azalea when they were attacked by a swarm of infected Gyarados. Before the monsters had a chance to do any kind of damage, Strix grabbed both Cyndaquil (who was out of his ball) and Toluca and swam far away from the shore. He found a small path of land not far, and landed there. They were separated from one of their team, in the fight...a uniquely colored Umbreon who had been traveling with them for awhile. After a few weeks on the island, Toluca ordered Strix to go to the mainland and search for Professor Elm, in hopes that he was safe…and if he wasn’t, to help him rendezvous with the rest of the professors at Mt. Mortar. Strix didn’t know much about the plans the humans had made, but he went without question to Mt. Mortar, to try and find the professor. When he arrived there, he had found nothing. He knew where the professor used to live, and figured that if he was alive still, he would probably head north of New Bark to get to Mt. Mortar. So Strix headed East of Mt. Mortar, in hopes of happening across the professor and escorting him safely. Appearance He looks like a standard Nidoking, fierce- looking. - He excels in working on a team and leading one, but can let his emotions get in the way sometimes. Pokédex Entry A smart and sneaky Pokémon. A pair may work together to steal eggs by having one lure the parents away. 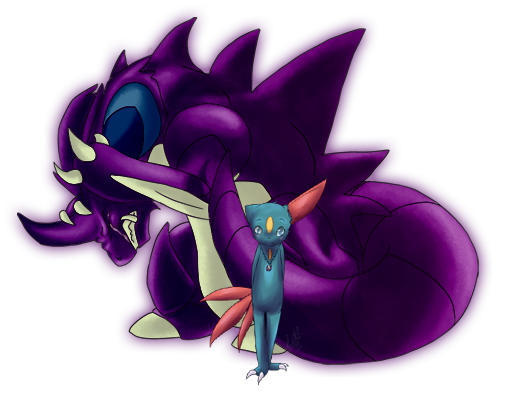 History Rune was born to a pair of well-bred Sneasel, both of which were abusive to her when nobody else was around. Being the only child, she thought the abuse to be normal, and that she was the one that was at fault. The owners were a pair of thieves, who specialized in acquiring rare antiquities for a specific clientele. Their wealth came from the sale of these items. In acquiring these items, they would employ the use of their Weaviles, and often trained their child for jobs as well. She put the training to good use, and often ran about the city and stole things for herself. She ran with a rough crowd, often crude and ignorant, but it was a nice reprieve from her parents' restrictive style of living. When her parents and owners took them out in public, her mother and father openly praised how beautiful and smart she was, of course attributing that to themselves and all their 'hard work.' Still, Rune kept an innocent and kind outlook for them, trying her best to be what they wanted her to be. Through the majority of her young years she did this, never once striking back at her parents when they beat her for not being 'good enough.' But after the mental abuse began to settle in and become a part of her, a darkness began to grow in her, eating at her insides. A self-loathing began to fuel everything she did, which only incensed her parents to treat her worse. And so went her life living in the human world; empty, gray and lusterless. When the epidemic hit, her parents fled with her into the snowy wilds. They were forced to learn how to survive with the basest of needs, salvaging for food and living in trees. Her parents blamed her for their 'poor' style of living, claiming they would have been able to eat and live better without her. Her father beat her that night for the last time. After they had retreated for sleep, she ran from the large evergreen and dragged a fresh corpse from the nearby town to the tree and smeared its blood on the bark, making sure to leave the blood trail. She then took to a tall tree a distance away, overlooking the area where here parents had been sleeping...and watched, and waited. She didn't have to wait long. The undead were constantly prowling at night, and had caught the blood scent almost immediately. They came in droves, tearing apart the corpse she had left there, when her mother woke up, startled by the sounds. She heard her scream, and wake her father. Rune watched in cold indifference as her parents were torn to pieces. - is very rude and gruff ; acts a bit rough around the edges. - She gets very quiet and serious if she is reminded of her parents. - She has a pretty decent knowledge of humans and a base understanding of their technology, and has a knack for getting away with shady things. - She's usually smart-mouthed, and doesn't give a crap what others think of her.